The holiday season in New York City is a sparkly, spectacular time – the tree in Rockefeller Center and 5th Avenue window displays bring wonderment to the eye and can inject any Scrooge with the Christmas spirit. But just as the holiday season is a time of celebration, it is also a time of giving. Brooklyn’s O.D.X-treme PRAISE SHOW, a weekly internet radio show on Everyday Radio, is giving New Yorkers the opportunity to celebrate and show a little charity. 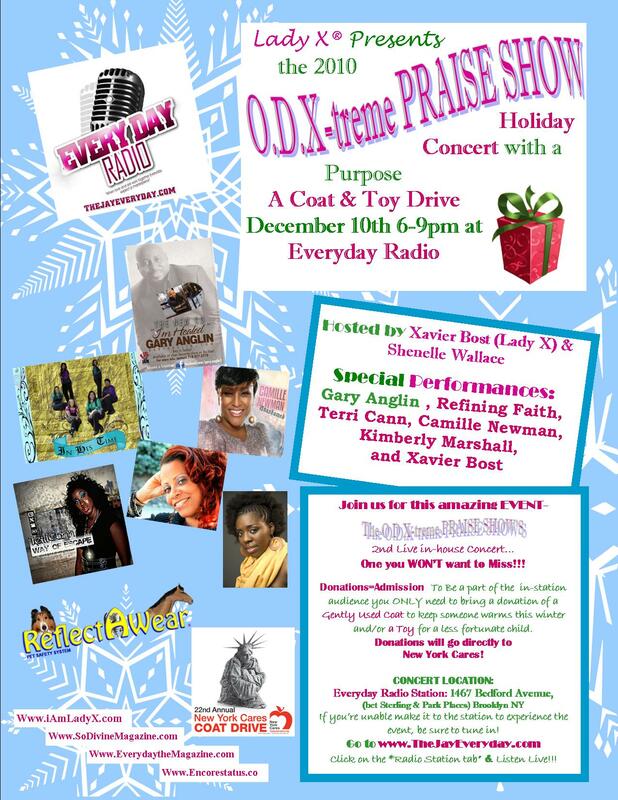 The O.D.X-treme PRAISE SHOW is having their annual Holiday Concert with a Purpose on December 10 at the Everyday Radio Station, located on 1467 Bedford Avenue in Brooklyn. The concert/ coat and toy drive is in its second year and will include guest performers Gary Anglin, Camille Newman, Xavier Bost and many more. In lieu of an admission fee, the O.D.X-treme PRAISE SHOW asks for audience members to donate a toy or slightly used coat which will go to New York Cares. Come on FAMERS show the city we love how much we care. Support this awesome event! Thanks so much Afrika…and thank you in advance to all who come out to support this important cause…Let’s keep our NYer’s warm this year and bring Joy to a child!! !